Global markets cheered as China's manufacturing PMI registered positive growth in March for the first time since October of last year. Still, the reading is weak and a bare-bones positive at 50.5. Ranking the headline diffusion index since 2005, the current index stands only in the 34th percentile of the historic queue of data over that span, a nudge above the lower one-third of the distribution. Since the median value occurs at a percentile value of ‘50' the current standing in its 34th percentile is well below the median. And that by itself underscores that the March reading is a subpar performance for China even though it registers growth. The point-to-point three-month changes show gains for most PMI metrics over three months (delivery speeds, employment and inventories of finished goods are exceptions). But the rebound is weak. Over six months, only four components are gaining: delivery speeds, order backlogs, stocks of major inputs, and imports. Over 12 months, delivery speeds, order backlogs and input prices are gaining with all other categories still slipping. Optimism may be starting to stir, but it has not yet gained traction. The queue (or rank) percentile standings on current levels of the headline and its components show only two PMI components with levels above their respective medians (percentiles above 50); they are order backlogs and stocks of major inputs. Employment and export orders have the weakest readings by far with percentile standings below their respective 11th percentiles. That connects the dots nicely between domestic weakness and international trade weakness. A close look at the times series of the PMI and its components shows a definite rebound in March across most components. Input prices have rebounded the most in recent months not activity variables. The question raised by the March result is whether this one-month broad-based rebound will have staying power or not. The exceptions to weakness in March are Russia, Brazil and Indonesia with rank standings for the level of their respective indexes in their respective 88th percentile or higher. The U.K. has a standing in its 72nd percentile. For the other 11 countries, only the U.S. (50) and China (64) have manufacturing standings at or above their respective 50 percentile level with the rest well below than mark. (Note: the ‘standings' for this table are from January 2014 forward, a much shorter period than for the CFLP data used in the first table that rank components and the headline back to 2005.) Ten countries/regions have standings within the lower one third of their respective queue of data. 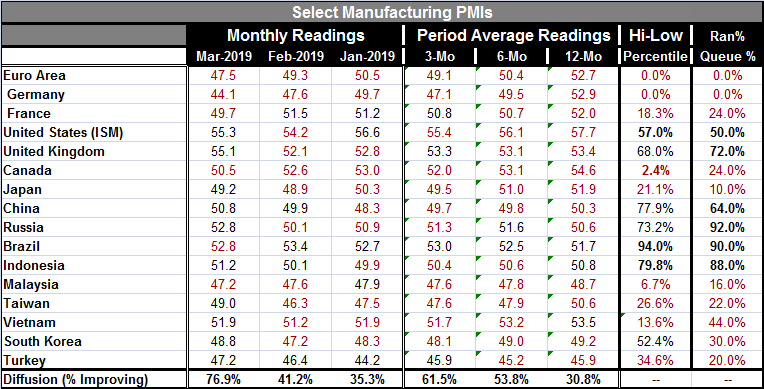 And while ten manufacturing PMIs did improve month-to-month in March, eight of sixteen still have diffusion readings below 50. And just to confuse things a bit more, the U.S. reported out retail sales results for February today that showed nominal sales unexpectedly declining. In the EMU, the preliminary inflation data for March showed deceleration with the core rate running at a 1% pace and the headline at a 1.5% pace. China is not signaling any global revival. Blackouts in Venezuela contributed to lower oil production and firming in global oil prices. But the direction for oil prices is far from clear. The sum of this news does not reach a clear conclusion. While financial markets like the China data, the U.S. data are unexpectedly weak as are weak inflation data for Europe. As a result, the growth signal is muddied. But many are prepared to set early-in-the-year U.S. weakness aside. The U.S. first quarter for the U.S. economy has a reputation for being weak despite repeated attempts to rectify the statistical problem. There is also the potential of lingering effects from the government shutdown that might still be a factor. After a run of weakness and horrific yield curve flattening and inverting in the U.S., markets seem poised for some wait and see. And the Monday data so far only produce cross currents. Even though the rebound in China's data comes with less widespread manufacturing weakness globally, the sense of rebound is not strong limiting the market reaction. There is a long slog of data ahead for this week with the U.S. monthly employment report waiting to anchor things on Friday. Nothing yet tips the hand on where the future is headed regarding global, U.S. or European growth.